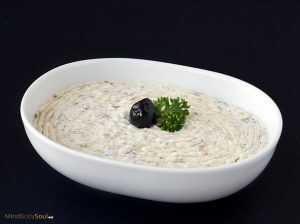 The wonderful aromas of the fresh garlic and lemon really come through in this quick and zesty eggplant dip! One cup of eggplant provides 10% of your daily fiber needs and contains polyphenols, with demonstrated anticancer properties. The anthocyanins and chlorogenic acid in eggplant work as antioxidants; fighting inflammation and oxidative stress-related damage in the body. Known to prevent tumor growth and stop the invasion and spread of cancer cells, they also stimulate the detoxification of enzymes within cells and promote the death of cancerous cells. Greek yogurt contains all the benefits of regular yogurt, plus extra protein. Greek yogurt also adds calcium, phosphorus, potassium, and vitamins A and D to your diet. Garlic is both flavorful and packed with health benefits, containing sulfur compounds that may stimulate the immune system’s natural defenses against cancer and have the potential to reduce tumor growth. Fight cancer in your kitchen, with these simple ingredients put together as a healthy, tasty snack! 1. On a stove top, place a perforated baking sheet and place your eggplants on top where the flame is, poke holes in the skin to keep the eggplant from exploding. 2. Brown your eggplants, turning occasionally until soft. Or you may also broil eggplants on a baking sheet, turning occasionally, until soft. 3. When cool, remove skin and stems. 4. Stir in lemon juice, olive oil, and mash the eggplants. 5. Add yogurt and garlic. Season with Himalayan sea salt and mix it all together.